Providing nail care to a patient also lies under the duties of a certified nursing assistant. These kinds of care treatments are provided to patients, who are quite weak to perform such daily activities. There are many patients available in the hospices or nursing facilities, who are not physically capable enough to give care to their toe and finger nails. Therefore, it becomes a CNA’s responsibility to check whether their nails required immediate care or not. When a patient is going under some treatment or is unconscious, then he/she sometimes starts scratching his/her own skin. This can bring in dangerous infections in the patients nails, which can reach anywhere in the various parts of the body. The nail beds of the patients carry various kinds of injurious germs. Hence, this is a nursing aide’s responsibility to keep it clean and trimmed on a regular basis. This prevents the infections from further spreading. On the other hand, if you are treating a person, who is under the anticoagulation therapy, then do not give him/her nail care, as this may cause excessive bleeding. Similarly, patients, who are suffering from diabetes, are also given nail care by a specialist or a doctor specifically. This is due to the fact that the body tissues of a patient suffering from diabetes gradually lose the ability to repair it naturally. As a result, a minor scratch on the fingers or foot can stimulate an ulcer. Thus, the accountability of performing nail care is not given to every CNA. In many of the medical facilities, this job duty is not assigned to the CNAs. Before conducting any such duty, you must check with the medical facility you are working. A CNA must have undergone a proper training and practices, before providing nail care to any patient. Make a habit of washing your hands thoroughly, every time you start giving nail care to a patient. Put on a fresh pair of hands gloves. Now, greet the patient kindly. Give the patient explanation regarding the nail care activity performed by you. Try to manage a face to face contact with the patient, while explaining the procedure. Before beginning this process, ensure that the devices and equipments, which are going to be utilized for trimming the nails of the patient, must be fresh and sterilized. Or else, it can cause infections. Always remember that providing regular nail care to the patient steadily reduces the risk of germs transmission. Things you will need for this process are a water bowl for warm water, a nail cutter, a clean wash cloth, a small towel, an orange stick and some soap. Before beginning with this process, make sure that the client is in a comfortable position. If possible, it is better to help the patient to get into a chair. If not, then you can set the bed at a comfortable level to conduct the process with ease. 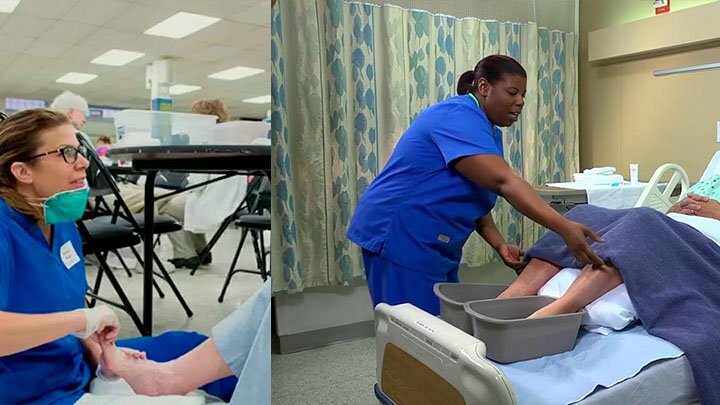 While helping the patient to shift in the chair, you must spread the foot mat on the floor to shun the danger of falling down. If the person is lying on the bed, then you must place a towel or a sheet on the table close to the patient. And then keep the nail care equipments over the table. You have to fill in the water basin with warm and soapy water, so that the fingers can be totally sterilized. It is imperative to get the water hotness checked by the patients themselves; however, in case of a feeble or unconscious person, you may keep it normal and check it by yourself. Once, the water temperature is checked; you must put the patient’s fingers in that soapy water for some time. After a while, take out the hands from the water and clean the nails gently with the help of an orange stick. Give a touch of the orange stick gently on the edges of the nails and stretch it slowly into right to left direction. Do not insert the tip forcefully into the nails; just let it stop where it has progressively. Make sure, you are doing this entire process with extreme care in a slow pace. Do not get tough with the fingers, as this procedure requires a lot of tenderness. Keep the dirty elements out of the nails and put it on the cloth. After, the cleaning is done, wipe the hands of the patient with a clean towel to dry. Now with the help of an emery board stick, do the filing of the patient’s nail gently in two to three strokes. In some cases, you might also be asked to keep the emery board and orange stick carefully in a container, for testing purposes. You must hold the patient’s fingers one by one to cut the nails. Only cut the extended part of the nails, as trained during your training sessions. When you cut every single nail, always check that there should not be any sharp or rough edges left. Trim the sharp edges of the nails, as it can cause cuts to the client’s skin. This also decreases the risk of infection transference throughout the breakage of the skin. Also, examine the client’s nail beds carefully, as you may also find any symptom of soreness or fungal expansion. If you find any such sign, report it directly to the charge nurse instantly. While cutting the nails, collect the cut part in a separate tray or a small cloth to dispose. Once, the filing and cutting are done, apply some hand-lotion on the patient’s hands from wrist to the fingertips. It is better to remove the excess amount of lotion from the hands, with a clean towel. Once, the nail care process is over, dispose the used linens and wash-cloth into the soiled linen box. At the end, wash the water basin properly with soap and keep the basin in the designated dirty supply area. Do not forget to rinse your hands thoroughly with soap to avoid contamination and infection. What does the auditor scrutinize when you act upon this CNA skill? It is highly essential for you remember the points, which an examiner observes most of the times from the beginning till the end of this task. Hopefully the given questions and tips will assist to perform this skill accurately. 1. Do you start the nail care process properly? Tip- Do not neglect to introduce yourself to the client and conduct other essential activities, prior to setting the client’s sitting position. 2. Do you wash, soak and dry the client’s hands properly? Tip- Washing the client’s hands in the soapy water or cleaning with a soapy washcloth, soaking them for a while, rinsing correctly and letting them to dry, are the vital functions of the nail care activity. 3. Do you clean the nails appropriately? Tip- After washing and rinsing the nails, now you have to clean the nails with the orange stick softly, to take out the polluted elements from inside. 4. How do you cut the client’s nails? Tip- Make sure, you cut the nails one after one and, that too very soothingly. Do not forget to trim the rough edges and smoothen the nails after cutting. 5. Do you ask about the client’s preference about his/her own nails? Tip- In terms of comfort, always ask the clients about the way they wanted their nails to be. However, In case of an unconscious patient make sure, you take care of their comfort altogether, or else you can take the help of a supervisor nurse or doctor in charge. 6. Do you filed and levelled the nails correctly? Tip- Filing and smoothening of the rough edges is an essential part; be sure, you do it in a correct manner. 7. Do you apply lotion on the hands? Tip- If the client wants and if it is applicable, then you must apply some lotion on the hands, when the filing is done. 8. How do you perform the end steps of this activity? Tip- Make certain, before leaving the patient’s room you have concluded the skills appropriately with steps required to do in the end. Always, provide correct and regular nail care to patients. So that, they can be protected from the risks of precarious infections and feel comfortable. Also, check the nail beds of the clients regularly, as they are the main source that carries the germs in our body. The video given below will give a clear demonstration of how the nail care of a patient should be done. This will assist to perform CNA skills during the CNA examination.